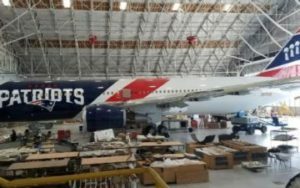 The New England Patriots purchased 767 planes exclusively for use by the team. They are the first NFL team to buy a plane (actually 2 planes). Acording to reports, the rationale for the big expense is that charter travel is getting expensive, and with the new comfortable planes, the team might have an advantage on the competition if they’re well rested. In college football, UCLA quaraterback Josh Rosen has been making waves when he told Bleacher Report that football and academics “don’t go together” and that “human beings don’t belong in school with our schedules”. He went on to say, “There are guys who have no business being in school, but they’re here because this is the path to the NFL. There’s no other way. Then there’s the other side that says raise the SAT eligibility requirements. OK, raise the SAT requirement at Alabama and see what kind of team they have. You lose athletes, and then the product on the field suffers.” Rosen is looking for more balanced academic and athletic experience. Johan Camargo, shortstop for the Atlanta Braves, was jogging out to the field ready to start the game against the Philadelphia Phillies on Tuesday when he tripped over himself and fell to the ground. He appeared to injure his knee. There’s no word yet on how serious this freak accident was and how long he’ll be out.